Do You Need a Commercial Sewing Machine? If So, Which is the Best? If you're thinking about taking your hobby to the next level, you're probably wondering whether you need a commercial sewing machine. Whether you're a quilter looking to sell your creations on the larger market or a garment-maker who wants to go pro, you'll need the right equipment. 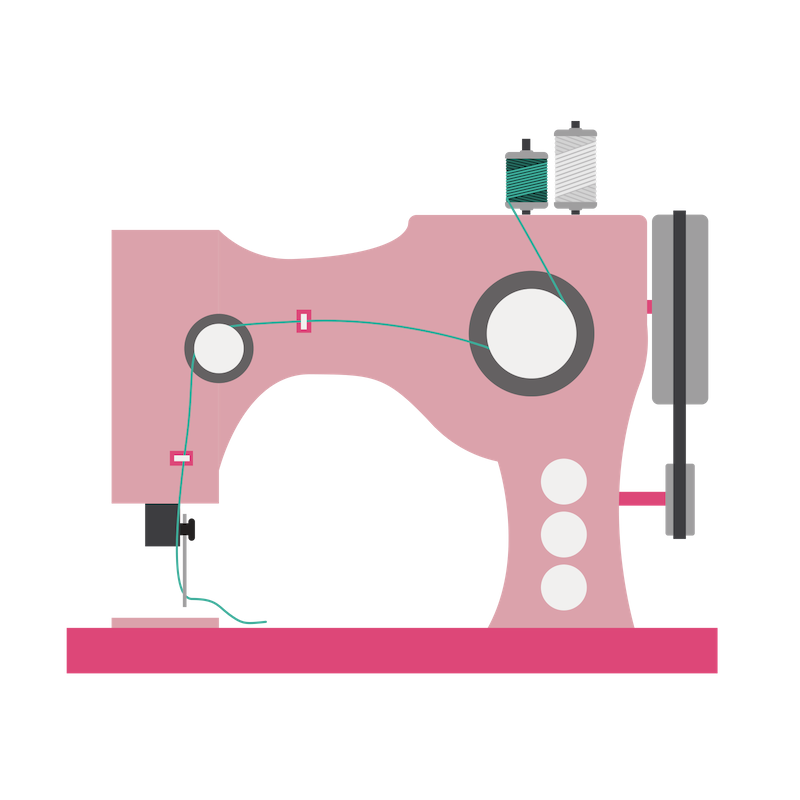 A professional-grade sewing machine can make production fast, efficient, and consistent. But it isn't cheap. And if you're thinking about taking that expensive machine as a tax deduction, you're going to have to do your research first. There are a lot of differences between a commercial sewing machine and a home sewing machine. A commercial sewing machine can cost several times what you'd pay for a high-end home machine. Also, many professional-grade machines are built to do one task well, rather than numerous tasks. Ask yourself: do you want a machine that can embroider, sew decorative stitches, serge, quilt, and do everything except the laundry? Then a commercial sewing machine probably isn't for you. On the other hand, if you're starting a business and need a machine for a single dedicated task, then that just might be your ticket. How is a Commercial Sewing Machine Different? Is a Commercial Sewing Machine Tax-Deductible? Do You Need a Commercial Sewing Machine? So, you've decided you need a commercial sewing machine. The question now, is, which one? To find our picks, we looked at machines in a few different categories. We reviewed straight-stitch machines, overlock machines (sergers), and embroidery machines. Then we looked at what professional reviewers had to say. Finally, we consulted consumer reviews to see what customers had to say about their purchases. A straight stitch machine generally sews straight stitches, and that's all. If you're mass-producing garments, sails, or other products that require long, straight lines of stitching, this is what you want. 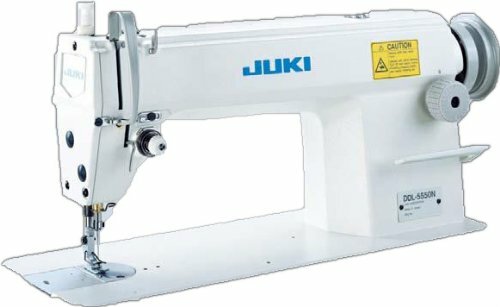 The Juki DDL-550 has made many "best of" lists, including Sewing Made Simple's Best Industrial Sewing Machine roundup. One of this model's most impressive features, in my opinion, is its top-of-the-line speed -- an incredible 5,500 stitches per minute. Many high-end home sewing machines top out at 1,000 to 1,500 stitches per minute. If you're going to be cranking out long seams, you want that speed. The 110-volt servomotor means that along with speed, you'll get precision control and a lot less vibration than with a clutch motor. This makes the Juki DDL-5550 a much more comfortable ride. The servo motor will also use between 30 and 60 percent less energy than a clutch motor. According to Sewing From Home, this is a top-notch heavy duty machine that can eat twelve layers for lunch, do pushups, and come back for more. The main disadvantages of this machine are that, first, as a dedicated straight stitch machine, you won't get any other kind of stitch. Some straight stitch machines also come with a zigzag. Not this one. 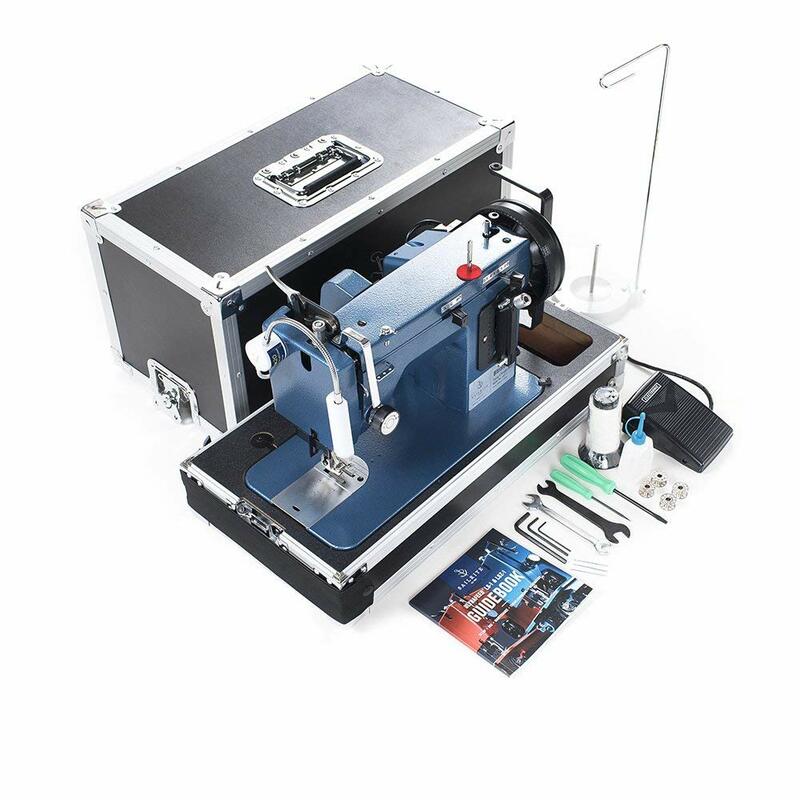 But if this doesn't bother you, then this could be the commercial straight stitch machine you're looking for. Second, this is an expensive machine. You can expect to pay between $800 and $1200. Customers who purchased this machine from Sewing Machines Plus gave it an overall rating of 4.5 out of 5 stars, and none gave it below 3 stars. Sailrite sewing machines have a cult following and for a good reason. They make a small number of portable and stationary straight-stitch machines, and they make the machines to last. If you're looking for a commercial sewing machine that can do both straight stitches and a zigzag, the Sailrite Professional Sewing Machine might be worth checking out. It comes with the option of two-point or four-point zigzag stitching, as well as the choice of a longarm or regular arm model. And if you're looking for a heavy-duty machine, well, that's what these machines are made to do. Like the Juki, the Sailrite Professional has a servo motor. This means an unbeatable combination of power and control. The Sailrite motor is a little bit more powerful -- 550 watts and .75 horsepower. The downside of all Sailrite machines, however, is the price. A versatile sewing machine with optimum performance. The purpose of a serger -- also called an overlock machine -- is to bind off the edges of the fabric. Period. Sergers typically use three to five threads to do this. And if you're going to be making garments professionally, a serger is a very necessary tool. The Tool Report loves this serger and has a lot of good reasons to. First, it's versatile on many levels. Sergers bind off fabric edges using between two and six different threads. Many machines only do one of these. With this model, you can choose to use between two and five different threads. Another great thing is the stitch selection. In addition to a basic overlock stitch, the Singer 14T968DC does three different cover stitches. What's a cover stitch? If you look on the hem of a t-shirt sleeve, you'll see a double row of stitches on the visible side, and a typical overlock-style stitch on the back. This is key to giving your garments that professional finish. Another positive is the price. Many industrial overlock machines can run you between $800 and $1,800. You can find this one for around $450 if you do your homework. One drawback that both the Tool Report and Amazon customer reviewers noted is complexity. 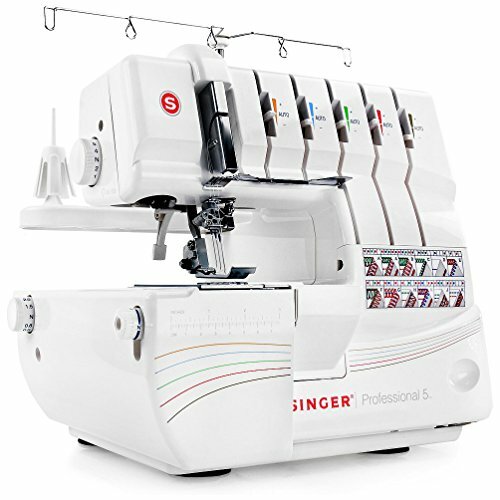 Threading a serger takes practice, and this machine has the added complexity of switching between overlock and cover stitches. Many people warn that this is not a machine for beginners. Amazon reviewers, however, give it an average of 4 out of 5 stars. If embroidery is your business, you have a lot of options. You can find, for example, numerous high-end semi-professional all-purpose sewing machines with astounding embroidery features. Many allow you to upload fonts and designs, and even edit them right on the machine. Commercial sewing machines come with different levels of features. Some do lettering only, while others do designs. It's important to consider your needs carefully before beginning your search. The Janome MB-4S is a good, versatile all-arounder. It does fonts, it does designs, and it allows you to upload your own designs and edit. The editing, in particular, is very advanced, and allows you 65,536 color variations. This machine has a remote computer screen for editing, and allows you to store up to 100 designs. It's also one of The Jerusalem Post's Six Favorite Commercial Sewing Machine designs. Amazon customer reviews are divided. This is an expensive machine, so there weren't many reviews to begin with. Most people loved it, and praised it as easy to learn and good value for money. The people who reported negative experiences reported that their machines arrived broken or defective. The average customer review was 3 stars out of 5. Is there a downside? Well, yes. This machine will be expensive. But if embroidery is your business, it may be well worth your time to consider. There are two main types of sewing machines. A domestic sewing machine is an all-purpose machine made for home sewing enthusiasts. A commercial, or industrial sewing machine, is made for mass production. If you're sewing for yourself and your family, you're likely doing some different kinds of sewing. First, you might use a straight stitch and a serging stitch for garment-making. I, personally, use a lot of decorative stitches when making gifts and housewares. And if you're sewing for children, a machine that can monogram and embroider the latest cartoon characters will see a lot of use. Lucky for you, there are a lot of sewing machines on the market that can fit the bill. And they're not that expensive. You can find a very decent all-purpose home sewing machine for between $100 and $400, and some truly astounding ones for a bit more than that. On the downside, home sewing machines are designed for shorter bursts of use, rather than constant running. For this reason, they often have smaller, less powerful motors than industrial machines. Home sewing machines are also, generally speaking, less able to stand up to heavy-duty work, such as ultra-thick fabric or multiple layers. But if you're a home sewing enthusiast, you don't need a factory-quality machine. Most home machines will do nicely. An industrial or commercial sewing machine is a powerful, robust machine. Many are designed for heavy use like leather or multiple layers of thick fabrics and designed for continuous running, day in and day out. Additionally, many industrial machines have large, external motors for this purpose. The other major difference is that a commercial sewing machine is, generally speaking, a one-trick pony. It does one thing, does it consistently, professionally, and for long stretches at a time. A garment-maker may want a dedicated serger, for example, for binding off garment edges. For sewing straight lines for garments or sailmaking, a straight-stitch machine is the tool of choice. If you have an embroidery business, you'll want a professional embroidery machine. And so on. The final difference is the price tag. A commercial sewing machine costs a lot. How much? It depends on the type of machine. In fact, many commercial sewing machines cost five times that or even more. That's a complicated question with a lot of possible answers. If you're a hobbyist who occasionally sells things on Etsy, then the answer is probably no. However, if you're starting your own business, and going through the proper steps to do it, then it very well might be. How do you start your business? It's complicated, but not impossible. First, you'll need Federal and State Tax ID numbers. You'll also need to acquire any licenses and permits required by your state, city, and county. 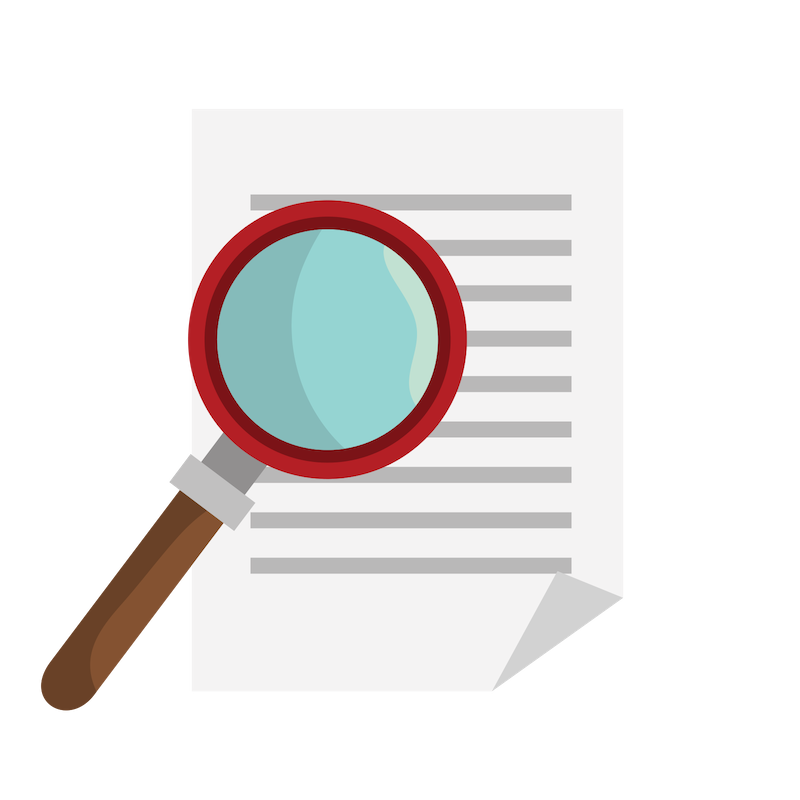 The types of permits vary, depending on where you live, and where you're planning to operate your business. You'll also need to register your business with the proper authorities. This process, also, differs by state. The Internal Revenue Service has some excellent information about starting small businesses in different states. If you're serious about starting a business, familiarize yourself with the laws and tax codes of your state. And if that business requires a commercial sewing machine, once you've set it up legally and filed your paperwork, a tax deduction might very well be in your future. Commercial sewing machines aren't cheap, and the price can depend on many factors. The machines we reviewed ranged in price from $600 to $5,000. Are you ready to step up to a commercial sewing machine? Ask yourself the following questions. First, are you starting a business? By starting a business, I don't mean selling things at local craft fairs now and then, or putting your projects on Etsy. Are you planning industrial-scale production? If so, then you will need a commercial sewing machine with a powerful motor that can stand up to continuous running. And if you do your homework and file your paperwork, you may even be able to deduct your investment as a business expense. Second, will your business focus on one type of sewing? For example, monogramming and embroidery? If so, you would do well to purchase a commercial sewing machine built for this kind of sewing. A dedicated embroidery, serging, or straight stitch machine will give you consistent and professional results. 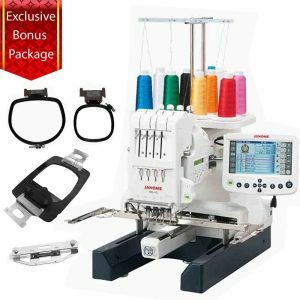 On the other hand, if your business is small-scale, or involves different kinds of sewing, you might do better to check out a high-end semi-professional sewing machine. There are numerous models made for advanced home sewing enthusiasts and small businesses, which might serve your needs better. Do you have a home-based sewing business? Or are you building a larger-scale business? What's your favorite commercial sewing machine? Tell us about it in the comments! Previous articleCan the Brother CS5055PRW Sewing Machine Sew Up Your Fashion Dreams?